Hadoop is a Java-based programming framework that supports the processing and storage of extremely large datasets on a cluster of inexpensive machines. It was the first major open source project in the big data playing field and is sponsored by the Apache Software Foundation. Hadoop Common is the collection of utilities and libraries that support other Hadoop modules. HDFS, which stands for Hadoop Distributed File System, is responsible for persisting data to disk. YARN, short for Yet Another Resource Negotiator, is the "operating system" for HDFS. MapReduce is the original processing model for Hadoop clusters. It distributes work within the cluster or map, then organizes and reduces the results from the nodes into a response to a query. Many other processing models are available for the 2.x version of Hadoop. Hadoop clusters are relatively complex to set up, so the project includes a stand-alone mode which is suitable for learning about Hadoop, performing simple operations, and debugging. In this tutorial, we'll install Hadoop in stand-alone mode and run one of the example example MapReduce programs it includes to verify the installation. An Ubuntu 16.04 server with a non-root user with sudo privileges: You can learn more about how to set up a user with these privileges in our Initial Server Setup with Ubuntu 16.04 guide. Once you've completed this prerequisite, you're ready to install Hadoop and its dependencies. Next, we'll install OpenJDK, the default Java Development Kit on Ubuntu 16.04. Once the installation is complete, let's check the version. This output verifies that OpenJDK has been successfully installed. On the next page, right-click and copy the link for the latest stable release binary. Note: The Apache website will direct you to the best mirror dynamically, so your URL may not match the URL above. You can safely ignore the difference in case and the spaces. 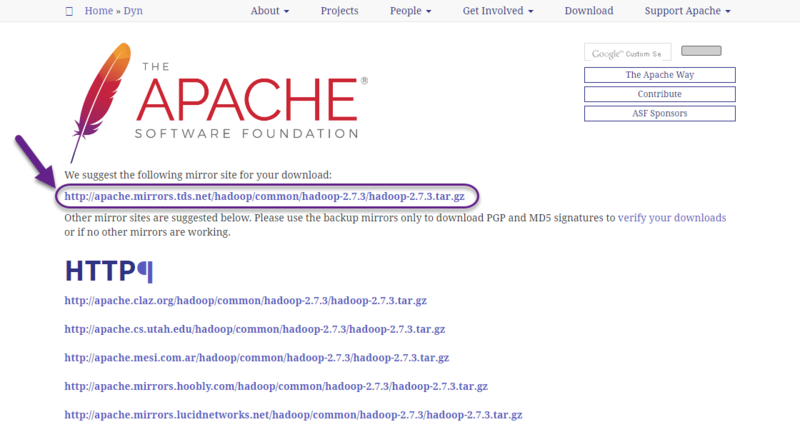 The output of the command we ran against the file we downloaded from the mirror should match the value in the file we downloaded from apache.org. Finally, we'll move the extracted files into /usr/local, the appropriate place for locally installed software. Change the version number, if needed, to match the version you downloaded. With the software in place, we're ready to configure its environment. Hadoop requires that you set the path to Java, either as an environment variable or in the Hadoop configuration file. The path to Java, /usr/bin/java is a symlink to /etc/alternatives/java, which is in turn a symlink to default Java binary. We will use readlink with the -f flag to follow every symlink in every part of the path, recursively. Then, we'll use sed to trim bin/java from the output to give us the correct value for JAVA_HOME. readlink -f /usr/bin/java | sed "s:bin/java::"
You can copy this output to set Hadoop's Java home to this specific version, which ensures that if the default Java changes, this value will not. Alternatively, you can use the readlink command dynamically in the file so that Hadoop will automatically use whatever Java version is set as the system default. Note: With respect to Hadoop, the value of JAVA_HOME in hadoop-env.sh overrides any values that are set in the environment by /etc/profile or in a user's profile. YARN applications, not this command. The help means we've successfully configured Hadoop to run in stand-alone mode. We'll ensure that it is functioning properly by running the example MapReduce program it ships with. To do so, create a directory called input in our home directory and copy Hadoop's configuration files into it to use those files as our data. When the task completes, it provides a summary of what has been processed and errors it has encountered, but this doesn't contain the actual results. The MapReduce task found one occurrence of the word principal followed by a period and six occurrences where it was not. Running the example program has verified that our stand-alone installation is working properly and that non-privileged users on the system can run Hadoop for exploration or debugging. In this tutorial, we've installed Hadoop in stand-alone mode and verified it by running an example program it provided. To learn how write your own MapReduce programs, you might want to visit Apache Hadoop's MapReduce tutorial which walks through the code behind the example. 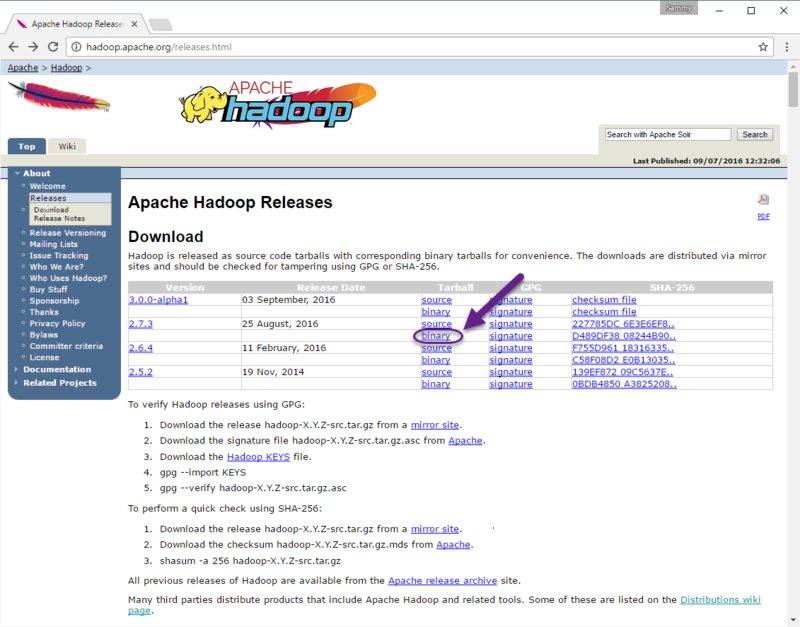 When you're ready to set up a cluster, see the Apache Foundation Hadoop Cluster Setup guide.